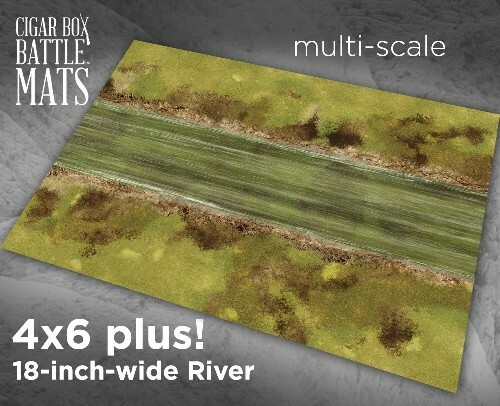 The 18" River (#232) mat is a very versatile, beautiful terrain mat! It is professionally illustrated and perfect for just about any river game. Use "as is" or add a bridge, roads, village, etc. to create an exciting "cross the river" scenario for just about any period and scale. We use this mat for 1/1200 ACW Ironclads, 28mm WW2 - Pegasus Bridge, 20mm Vietnam, 10mm Ancients, 15mm Napoleonics, 6mm ACW, 54mm Vikings, etc. What would you use it for? This mat will match fine with many of our other mats to create an exciting amphibious wargame (raiding Vikings, Vietnam, French and Indian War, AWI, WW2, etc), or combine several of these mats to create and epic convention or club game! • Any scale tabletop miniature wargaming!